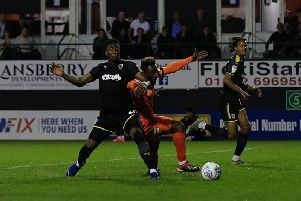 Luton Town were held to a 1-1 draw by Stevenage at the weekend after taking the lead through striker James Collins, only to concede a late equalier. Here’s how the Hatters players rated on the day. Marek Stech: 6.5 - Had precious little to do in terms of shots on target as neither keeper were particularly over extended during the afternoon. Couldn’t do much as Newton was left unmarked from the corner either. Jack Stacey: 6.5 - Never really advanced too much over the half-way line as he has been accustomed to, ensuring Luton kept things tight defensively for lengthy periods. Dan Potts: 6.5 - Few bobbles made it a tricky afternoon for the full back, while he might have put Town ahead only to miss a great chance at the far post. Tenth booking of the season means he will now sit out the next two games. Alan Sheehan: 7.5 - Skipper was always competing with Revell when Stevenage went long, ensuring the forward found it hard to bring others into play. Set-pieces were constantly dangerous too, with Luton almost taking advantage on more than one occasion. Glen Rea: 7.5 - Like Sheehan the pair kept Stevenage’s attacks quiet for the most of the game, as leading scorer Godden was eventually taken off having been snuffed out. Flynn Downes: 6.5 - Not the kind of game where he was going to be able to get the ball down and have the same kind of influence he did on debut against Exeter. Good learning curve though. Olly Lee: 6.5 - Wasn’t a day to have time and space in possession as the surface, conditions and opponents dictated otherwise. Got stuck in though as best he could. Luke Berry: 6.5 - Never really looked like tormenting the Boro defence as he did in the game at Kenilworth Road back in October. Effort and energy can’t be faulted on the heavy surface. Harry Cornick (STAR MAN): 7.5 - Easily Luton’s brightest spark on the day as was the main outlet when Town broke, using his pace to try and isolate Vancooten. Got in some good positions and just not quite able to pick out his man in the box. James Collins: 6.5 - Purposeful and dogged run into the box to win the penalty as he was clearly taken out by Henry. Kept his nerve to fire home as you never got the feeling he wouldn’t. Jake Jervis: 5.5 - Bar a few sorties down the left, didn’t offer that much in an attacking sense for the Hatters. Blasted one chance over and couldn’t direct another header on target. Andrew Shinnie (SUB): 5 - Unable to add the kind of poise in possession he usually does. Pelly-Ruddock Mpanzu (SUB): 5 - One great run on the left when he was cut down but couldn’t really add the drive Town were looking for. Lawson D’Ath (SUB): 5 - Needlessly gave away the corner that led to Stevenage’s leveller.